This is my last issue before I can finally get my car registered. You guys have already been so helpful (thanks ezone for helping me nail down my speed sensor issue), I hate to just keep taking and taking. I always try to do my homework before asking for help, but I'm just done with this one. So, still 2003 Honda Civic LX, throwing OBD II code P0135. I've done a lot to both the primary and secondary O2 sensors trying to fix this (didn't even realize there were two at first), unfortunately, I think I wasted a lot of time as I wasn't really able to discern for absolute certainty (and I'm still not 100%) which is the primary and which is the secondary, which is upstream and which is downstream. One of the first things I did was follow the steps in my service manual for troubleshooting. Looking for a primary O2 sensor that read 10-40 ohms ended up being a monumental waste of time as it turns out this is an error in the service manual -- the secondary should read 10-40 while the primary should read 3.0-3.4. This and a lot of contradictory information online have led me to be very confused about what a good/bad reading is. The primary sensor that came with the car reads 3.9 ohms. Seems slightly out of range. I ended up making a long trek to a Honda dealership to purchase one of their OEM sensors. It reads 7.9 ohms. What. The. Hell. I bought it, installed it, no change. Prior to this I had gone to a couple different parts stores and checked readings on Bosch and Denso sensors before purchasing them -- they consistently read 3.5-4.0 ohms, nothing below 3.4 ohms. Very, very confusing. In any case, assuming the O2 sensor that connects to the front of the engine near the cat (easiest to get to) is indeed the primary sensor, the upstream sensor, the one I should be looking at and assuming that something between 3.5 and 8 ohms makes for a good heater element (I've tested 3 different actual sensors in this range, I can't seem to get my hands on anything less) I've exhausted my troubleshooting chart to "replace the ECM/PCM". I've read more than once that no one has actually confirmed fixing this by replacing the ECM I have a strong feeling that's going to be true in this case, as well. For additional information, after an ECM reset, the light comes on about five seconds after starting the engine. It's turning on is accompanied by an additional hum/sound coming from the engine -- possibly fans starting? I'm not sure. It MAY be possible that the female pins in the harness have been flattened out. They look a tad low, but I can't really tell by eye. I wish there was a surefire way to confirm this. Do I have the world's worst luck when it comes to finding a good part? Am I confused about which sensor to replace (I did replace the other sensor, with no joy)? Do I actually need a new ECM? I don't know what to do next. It's beyond irritating that I can't register this damn thing because it doesn't have the optimal fuel burn for the first five minutes of operation. Stupid-*** reason to fail smog, IMHO. It's called a pin drag test. Using a correctly sized male terminal, you insert it in the female terminal and note how much drag there is, how much grip the female terminal has on the male. If one is not nearly as tight as another, the loose one may cause poor and intermittent or no contact. 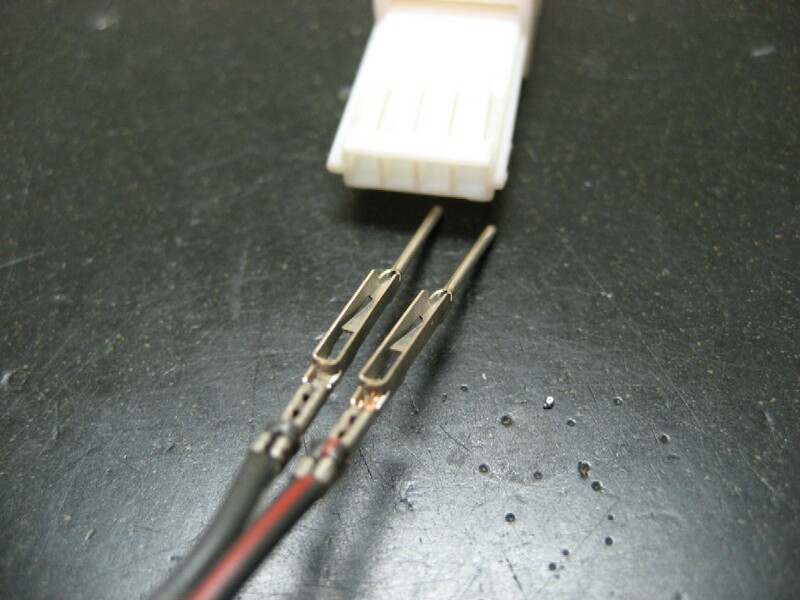 HINT: Shoving a voltmeter probe into a small female terminal will spread it out and ruin it, then it will no longer be able to grip the correctly sized male terminal. That should be obvious, and it does happen. Also, terminals do wear out and break in places you cannot easily see, that causes problems. You ohm tested all sorts of sensors, but did you ever check if there is power and ground being supplied to the sensor heater? I feel like I was always gentle with the female terminal when measuring it, but who knows. Every male connector I plug into it fits snugly and firmly, no looseness to speak of. Yes, voltage and ground on the harness are good, testing it was part of the service manual troubleshooting steps. Every male connector I plug into it fits snugly and firmly, no looseness to speak of. One single individual male terminal, removed from its connector, is used to check the female terminals. And oh yeah, the primary sensor, 1/1, leading, first, upstream, etc is the one closest to the engine in the exhaust stream. Ah, alright, gotcha. I don't think I have anything really sufficient to do a test like that. I could buy something online. Or, maybe it would save time by just jumping to: what do I do if the female terminals are loose? Replace it? What part would I be looking for? On a scale of dumb to really dumb, how dumb would it be to splice the harness wires into the sensor wires? Got a bad original sensor? Hack (disassemble) a male terminal out of that? Right now I have a $115 OEM sensor I bought from the dealer and the one that came with the car (could be bad, could be good -- I'm guessing it's probably fine). The guy at the parts department was very kind and said he'd allow me to return it this week if it didn't end up fixing my problem. So, I don't really have anything to chop up. I returned the OEM sensor and got a less expensive Denso to replace it, its resistance measures a very-close-to-spec 3.5 ohms. I sacrificed the original sensor that came on the car and ripped out a male connector pin. I used it to do a drag test on the female connector on the harness and it slides snugly into each receptacle, no looseness. I can even see the little scratch marks on the sensor pins where the female rubs up against it -- there's definitely a good connection. So does this new sensor make the computer happy? In your first post about the vague ohm specs, you would be happy to know that Honda removed many of the resistance specs from their service information. They expect you to test wiring and power and ground then try a known good sensor.....instead of just giving us some accurate specs we can use. I occasionally test new ones before installation, and try to keep notes. No, new sensor is still throwing the code just the same. Are there any tests I can perform beyond the chart in the service manual that may help track down the issue? The FSM pretty much covers diag. What's next, "substitute a known good PCM"? Currently installed sensor is a brand new Denso. Ok, sorry. It's a 2003 Honda Civic LX, manual transmission. Would you happen to have a part number handy so I can make sure I order the right ECM? Google searches have been vague. Thank you. whats the part number on the denso sensor? Civic is at home right now, so I'll have to check tonight to verify, but I'm pretty sure it's Denso 234-9005.
if so, you've got the wrong sensor. you want a 234-4074. the 9005 is what my HX uses, its a wide band air/fuel sensor, not an O2 sensor. Interesting. I will verify when I get home, but that sort of has more to do with the efficiency of oxygen sensing portion of the part, no? I'm dealing with a heater circuit issue (or so the CEL would have be believe). Is the wrong part going to perhaps draw voltage incorrectly and interfere with the heater circuit? i just bought my civic a few weeks ago. its a 04 HX and it had the P0135 code on for the heater. the previous owner had the wrong sensor in it and it was throwing the code. i got the correct sensor, which for me was the 9005. i drove it for 7 miles and the light turned itself off, and has not come back since. i have sense cleared the code that was still there but not active. i fully believe that the sensor that was in there works just fine and would be fine in the correct application, it just wasnt the right sensor for my application. i suspect that if you got the correct sensor, your problem would go away. i wouldnt even both testing it electrically unless it did not remedy the issue within a few miles of driving it. i suspect that there is also nothing wrong with your ECM. I'll check it out for sure. I haven't tried driving at all after making adjustments, I just reset the ECM and then restart the car, CEL throws the code after about 5 seconds of the car running. Due to the nature of the code, driving around wouldn't seem to make any difference as this has to do with how fast the heater element heats up from a cold start. Thoughts, ezone? i didnt reset my ECM, i just installed and drove. that could be the difference here. B1S1 is the primary or first sensor. Make sure you've been messing with the correct sensor. On an LX it's the one up top in the top part of the exhaust manifold above the catalytic converter, not the one down low in the pipe under the cat (that's the secondary sensor). Resistance on the sensor heater, my info says 3.0-3.6 ohms at room temp. If the heater circuit draws more or less than the specified amperage (programmed value), it's considered a failure and sets the code/turns the check money light on. Spec range I found is 0.37 amp minimum to 6.0 amp maximum. Anything outside that range for 5 seconds or longer while the heater is activated is fail. Remember, the amp value changes as the heater element temperature changes. 5 seconds after startup is the time it takes for the PCM to test the heater circuit on this car. If it fails the self test, the check money light comes on at that time. Manually clearing codes is always preferable IMO. I'd rather know right away if I did not fix the car, than have to wait for 3 or more trips to see if the stupid light goes out on its own. An oxygen sensor needs to be heated to 800-1000*F before it can become stable and accurately sense oxygen (become active), and engineers need these things to get active ASAP so they can get fuel delivery under control very quickly to meet EPA emissions regulations. A heated sensor can become active in maybe 30 seconds or less instead of~~ several minutes for an unheated sensor. The primary sensor on an 01-03 car is a regular Oxygen sensor. The primary sensor on a 04-05 car is an Air/Fuel Ratio sensor sometimes called a wideband sensor. They look the same, smell the same, do about the same jobs, but internally are very different, the computers are different, and the AF sensor is far more accurate. They are not interchangeable. People often will stick an O2 sensor in place of an AF sensor BECAUSE CHEAPER and then have no clue why it doesn't work right. The PCM's have been quite reliable in my experience unless an output got shorted or someone leaves the alternator bolts loose. *Use a low wattage test light to verify and prove if the primary heater circuit gets turned on when the engine is started. If it does not light up at all, something is very wrong and more checks are needed to see which side is missing (pos or neg). Bulbs vary in size and resistance and wattage of course, so a random SMALL 12v bulb may not make the computer happy but it should tell you if it's got a complete circuit that can work. Load test the bulbs before using, see exactly what the bulb draws on an ammeter and make sure it's less than the amp load max spec mentioned above..
*Use an ammeter in series with the sensor to read the actual amp load of the heater during operation. I have (had) like a 1000 pack assortment of resistors......and I might string some together to obtain a desired resistance, an experiment to see if I can find a value that makes the computer happy. If I can find a good number, then I can look for a sensor with a heater element resistance that's close to that value. *Unplug the OTHER O2 sensor (bottom sensor) and make sure it sets P0141 code, just to verify. *Make sure the wire colors in the engine harness side of the O2 sensor connector are in the right places, if someone hacked it and got wires into or connected to the wrong holes---it may rock your world. Thanks for editing this page of Civicpedia! I read every word and I am still digesting all the info. Q: Does the AF sensor and updated computing allow the 03-05 Civic LX to run more efficient and perform better than the 01-03 LX? or is it just more advanced and expensive to replace parts on? It's all about emissions. More accurate fuel control means lower emissions. They are also slightly different physically. On the left is the wide band AFR sensor. On the right is the narrow band O2 sensor. You want the one on the right. Nobody would know there's a difference unless they have a known correct and identical one to compare with. Then my tiny little brain remembered that when the guy sold me the car, he told me he had the engine swapped. This engine has VTEC (though it doesn't work, he showed me how to wire up a switch to a solenoid to engage it manually and I haven't bothered). I do believe this car is a real-deal hack job, especially since I corrected my speed sensor voltage issue by unplugging the cruise control from the fuse box even though the cruise control module has been pulled. So, that must make this engine a D17A2, yes? Which means it's a non-VTEC ECM running a VTEC engine. Seems not-right and problematic. If I do get the correct O2 sensor for the engine in, is the ECM even going to know/care that it's not the right engine? Actually, the guy said the engine was from Japan, so I guess this makes it a JDM d17a, which I'm reading for all intents a purposes is the same as a d17a2. I'm reading about people doing these conversions and have issues with hooking up their secondary O2 sensor and having to do some creative wiring. I'm starting to have an inkling that whomever did this wiring didn't do it right. I'm not sure where to start testing on this, now.